The registration for the speakers of NoSP 2014 has now been completed. For other conference guests, there is no need for registration. However, we have now opened a registration form for the NoSP 2014 conference dinner for those NoSP members who will not attend the conference as speakers. The dinner takes place at at the Restaurant Suomenlinnan Upseerikerho on the scenic fortress island of Suomenlinna on Saturday 26 at 7pm. The price of the dinner in this occasion will be EUR 48, which includes tickets for the short ferry ride to the island. The fee will be paid at the registration desk in Helsinki. Please note that there are only limited seats available! Please fill in your personal information and choose whether you would like to choose a non-vegetarian or a vegetarian main course for the dinner. The registration is open until March 28, 2014. Please note that the registration is binding. Otherwise the conference is free of charge. The program of the conference will be published in March. The registration form for the SPEAKERS OF THE NoSP 2014 is now open until FEBRUARY 28, 2014. Please notice that the registration is binding. The conference dinner will be open for STANDING MEMBERS of the Nordic Society for Phenomenology who will not attend the conference as speakers. A separate registration form will be opened on MARCH 3. 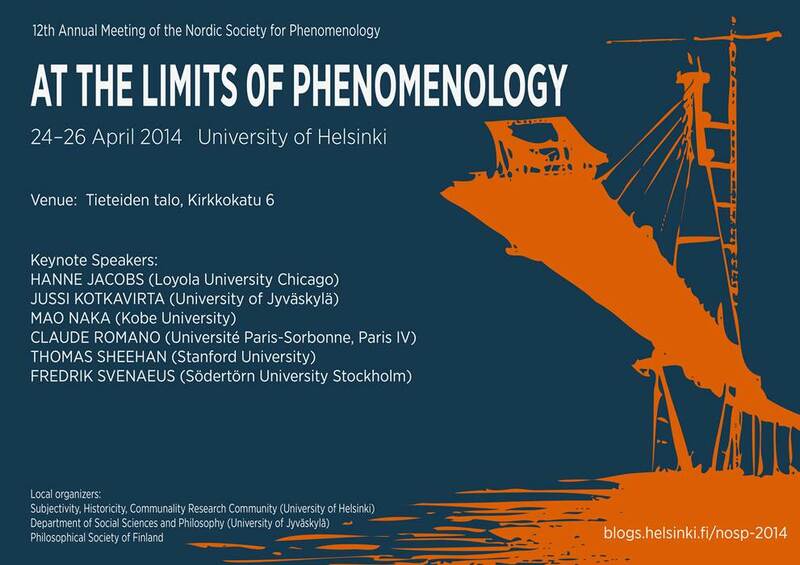 The final plenary talk on Saturday, April 26 will end at 5:15 p.m., and on Saturday evening there will be a conference dinner on the scenic fortress island of Suomenlinna (the price of dinner is EUR 30 for conference speakers and EUR 48 for other NoSP members. Both prices include tickets for the short ferry ride to the island). The fee will be paid at the registration desk in Helsinki. There are no other fees for the conference.